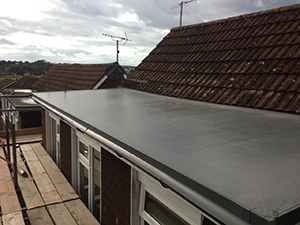 Flat roofing is an ideal solution for a smaller structure, such as a garage or extension- both new builds and refurbishments. it uses a flat, horizontal base, with fixings to the ceiling joists below, then a waterproof membrane is applied. The roofing is made using asphalt, or three ply modified bitumen (more commonly known as felt flat roofing). A thin layer of gravel helps protect the roof from UV sunlight. Sps Flat Roofing provide services throughout Exeter and Devon, why not use the tile above and contact them today for a quote. 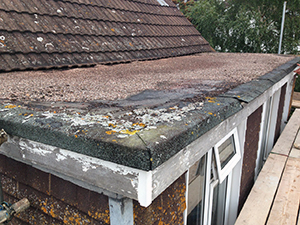 Before (SPS Flat Roofing project, Ottery St Mary). The roofing has a lifespan of more the 40 years- twice the expected life of a flat felt roofing product. The more common pitched roof has its disadvantages. The expense of a pitched roof is far superior to the cost of a flat roof, and it is a greater weight for any foundations to take. After (SPS Flat Roofing Project, Ottery St Mary).